Phil Simon is a technology cupid. Whatever your company’s issues or objectives, he can recommend the optimal platform, rollout strategy, and operational considerations. In his work as a tech consultant, he’s realized the days of “big iron” – solving problems with huge, expensive systems are gone. Now, it’s the nimble, inexpensive technology that rules. 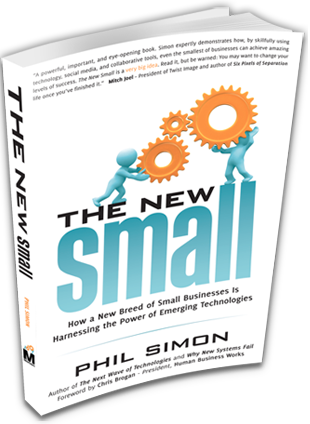 So much so, he wrote a new book (his third) about it called The New Small: How a New Breed of Small Businesses is Harnessing the Power of Emerging Technologies. I interviewed Phil earlier this year about his previous book, and it’s great to have his sharp thinking back at Convince & Convert. Historically, big technology had the advantage because it was safe and reliable. “Nobody ever got fired for hiring IBM” is the old saying. But now, it seems like small tech has the edge. How can that be? What changed? Many things changed. Broadband exploded. Storage costs plummeted. Freemium took off as a business model. A massive wave of innovation occurred. Other tech events and trends made the New Small possible. Factor in a drop in job security and a desire for people to do their own thing and suddenly it’s hip to start your own company. Are the companies you profile in The New Small using more technology, using technology to do more things, or just using the same amount of technology – but smarter? That question gives me pause. In short, it depends. They certainly use collaborative tools to a much greater extent than many large organizations. Many big companies can’t get out of the way of themselves. They have too much technology but it no longer meets their needs—if it ever did. I’d probably say that they use fewer tools, but they use the ones that they have much more efficiently than lumbering behemoths. What I love about many of the case studies in the book is that they demonstrate that smart use of technology makes the company’s life easier, but also reduces friction for their customers. It’s a double win. Is that a trend, or just a randomly occurring side benefit? I’m so glad that you mentioned that. As I point out at the end of the book these companies have fewer layers. The traditional chasm between management and rank-and-file employees doesn’t exist, for example. Along these lines, employees can take care of customers much easier. You won’t find 800 numbers at most of the companies; it’s not hard to talk to an actual person. Widespread adoption of nimble technology can give small/medium companies an advantage over bigger guys. But that’s only true if you have people that can master the technology at the task layer. How important is personnel in this technology equation? I’m not so sure that a level of mastery is required. Plenty of partners and vendors are able to handle things traditional done in house. For example, the law firm that I profile got out of the IT business so its employees could practice on what they do best: practicing law. It sure helps to be a technical wizard, but that’s no longer table stakes at these companies. A key theme in the book is The Five Enablers. Could you summarize that principle for us? Sure. Five key technologies are driving an enormous amount of change: cloud computing, SaaS, open source, mobility, and social media and networking. Smart adoption of nimble tech is allowing the New Small to do much more with less. They can reach customers, lower costs, and find and retain top talent like never before. It seems to me that the pace of innovation is really ramping up. It feels like 1999 again, but Bono has less hair. Is the amount of new technology a net advantage or disadvantage to business owners? Bono’s sure not the only one. It’s a great point and I make it in the book. Many small business owners are awash in a sea of technology, unsure about what to do. In a nutshell, that’s why I wrote the book. If managed intelligently, I believe that it’s an advantage. That’s an important disclaimer, however. The book covers a ton of ground, and is very straightforward and usable. You’ll wear out a highlighter on it. The chapters are very self-contained, so much so that you probably wouldn’t have to read from the front to get a ton of value. Was that on purpose? Yes. People are very busy. You might not care about a dental office, for example. I wouldn’t recommend skipping any chapter, however, because it might prompt a thought that would otherwise occur to you. This is the first book you’ve written outside the “traditional” publishing realm. Why did you go this route this time? Many reasons. My previous publishers were very interested but couldn’t meet my timeframe. One wanted to charge far too much for the book. I write about current trends and, should this book have been released in mid-2011, it simply would have been less relevant. I wasn’t willing to wait. What’s more, I wanted to control the process, up to and including the cover. That’s key these days, as I saw recently on CBS. This is my third book and I know what I’m doing. I spent a great deal of money to get this book done right. I started Motion Publishing because I believe that I can produce a quality text, both inside and out. What questions do you have about using technology in your business? Ask away, and Phil will help where he can.